The Round Lake Area Exchange Club and sponsor, Mano a Mano Family Resource Center, are proud to announce the April Hometown Hero, U.S. Marine Lance Corporal Andrew Cruz, a resident of Round Lake Beach. He was registered for this honor by his parents, Steven and Tracy Cruz also of Round Lake Beach. Cruz is a 2009 graduate from Round Lake High School. He is an Aviation Precision Measurement Equipment (PME) Calibration/Repair Technician. 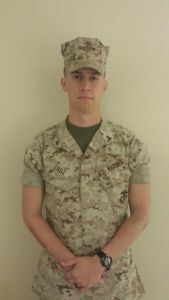 According to his parents, “He calibrates, repairs, and maintains equipment vital to the readiness of the flight line and aircraft directly connected to a Marine Aviation Logistics Squadron.” Some of the awards he has been awarded are the National Defense Service Medal and Global War on Terrorism Service Medal. Cruz and his wife Jill along with their daughter, Madison, were home this past January. The couple are expecting expecting their second child, a son, in July. With the generous support of this month’s sponsor, Mano a Mano, Cruz’s “Hanging with the Heroes” care package will be filled with beef jerky, Peeps, gum, crackers, Cliff bars and other snacks. Also included is a personalized “Hanging with the Heroes” t-shirt (donated by Artrageous of Hainesville), letters from Round Lake Area School District 116 students, a specially made rosary for the military from Legion of Mary from St. Joseph’s in Round Lake and a piece of home.The Hometown Hero website is managed by Fokoz Creative Group of Grayslake. The Round Lake Area Exchange Club will present a plaque to his family on Wednesday, April 22, at 7:30 a.m. Panera Bread in Round Lake Beach.